This first option for an Unforgettable Day in Venice offers the possibility to visit all those sights that you should absolutely see when visiting Venicebooking one single tour. 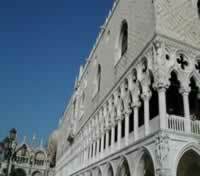 In the morning you will see the most important museum we have in Venice in the city: the Doge's Palace. Visiting the former house of the Government of the ancient Venetian Republic you will learn about the origins of Venice, the main events which characterized the 1,000 years of her independence, the peculiar political system that Venice created, and the main artists of the Venetian School of Painting. You will also see the Bridge of Sighs and the ancient Prison of Venice. After the palace you will see the Basilica of St Mark and admire the 9.000 square feet of golden mosaics. You will then continue the tour enjoy a boat ride to admire the Lagoon of Venice from the water perspective. This is when you will realize how huge is the Lagoon and how many different aspect it can offer. After the boat ride you will visit the Island of Murano, famous for its glassmaking. Until 17th Venice retained the monopoly of high quality glass production, and the skill of the glass masters is still today unequalled. You will see one of the best know furnaces where the authentic production takes place (it won't be just a demonstration, as most of the tourist factories offer). You will have some time for shopping and the you'll ride back passing by the old and glorious Shipyard and the island of Lido. Upon request we can include a lunch break, and, if you want, we can suggest and book for you the best restaurants in the area. You need to advise about a lunch break when booking the tour. 1) food and wine tasting by one of the traditional Venetian eateries around the Rialto bridge. The price includes: the service of a certified tour guide for 5 hours and the hiring of a private luxury water taxi for 1 hour plus the ride back to Venice. This tour is conceived for easygoing visitors and offer a more general overview of Venice, to learn about essential history and art, but also to browse around, see picturesque corners, taste delicious food and relaxing. You will begin the tour with a walk through the Square of St Mark to see its most important monuments: the Bridge of Sighs, the Doge's Palace, the Bell tower and the Basilica of St Mark (a visit to the church and its treasuries is included). The price includes: the service of a certified tour guide for 6 hours and the hiring of a private luxury water taxi for 4 hours. The price does NOT include: entrance fees, food or beverages. Our third option is designed for the appreciators of Art who are eager to discover the cultural treasuries Venice has to offer. The tour begins with the visit to one of the most important artistic sights in Venice: the Accademia Galleries where the richest collection of Venetian paintings is preserved. It's an incredible journey through the evolution of Art in Venice covering 5 centuries, from the 14th C to the 18th C.
After the Accademia, we'll take a relaxing break along the Zattere to enjoy the best ice cream you can find in town (or a drink/coffee). A luxury boat will then pick you up for a ride through the canals of Venice, to admire the wondeful palaces and their architectural styles. At the end of the boat tour there couldl be a short break for lunch if needed and requested at the time of booking (we can book for you a restaurant on request). The tour will continue with the visit to the ancient Brotherhood of St Roch, where you will see more than 50 large canvasses painted by Tintoretto, one of the greatest Renaissance painters Venice ever had. The Frari's Church will then follow to see Titian's masterpiece, the Assumpion of the Virgin Mary, and many other works of art by Titian and other artists. A walk through the district of San Polo will then take you to the Rialto Bridge, where the tour will end. Customized tours: you can also design your own Day in Venice selecting and combining together different parts of our tours, that you can find on this or other pages of our web site.